In cell biology, a mitochondrion (plural mitochondria) is small structures in cells that generate energy for the cell to use, and are hence referred to as the "powerhouses" of the cell. These "petite organelles" range from 1–10 micrometers (μm) in size. of enzymes, that float in the cell’s interior and are called as "cellular power plants" because they generate most of the cell's supply of adenosine triphosphate (ATP), used as a source of chemical energy. In addition to supplying cellular energy, "petite organelles" are involved in a range of other processes, such as signaling, cellular differentiation, cell death, as well as the control of the cell cycle and cell growth. The organelles have been implicated in several human diseases and may play a role in the aging process. Several characteristics make the "petite organelles" unique. Their number in a cell varies widely by organism and tissue type. 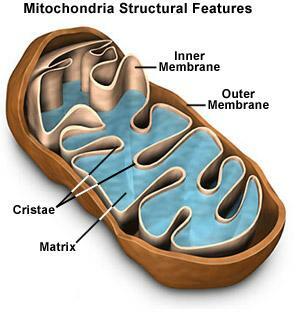 Many cells have only a single mitochondrion, whereas others can contain several thousand of them. The mitochondrion is composed of compartments that carry out specialized functions. These compartments or regions include the outer membrane, the intermembrane space, the inner membrane, and the cristae and matrix. In humans, "petite organelles" contain about 615 distinct types of proteins, depending on the tissue of origin. Hundreds if not thousands of mitochondrion are present in every cell. They are also special because have their own DNA. Although most of a cell's DNA is contained in the cell nucleus, the mitochondrion has its own independent genome. Further, its DNA shows substantial similarity to bacterial genomes. Mitochondrion is found in nearly all animals, plants, and fungi. They vary in number and location according to cell type. Substantial numbers of them are in the liver, with about 1000–2000 mitochondrion per cell making up 1/5th of the cell volume. The mitochondrion can be found nestled between muscle cells or wrapped around the sperm body cell. Often they form a complex 3D branching network inside the cell with a dynamic structure that maintains cell shape, protects the cell, enables cellular motion and plays important roles in both intracellular transport (the movement of organelles, for example) and cellular division. The most prominent roles of the mitochondrion are its production of ATP (energy) and regulation of cellular metabolism. The ATP production are known as the living cells use oxygen as part of cellular respiration to produce energy trough the pathway of a chemical conversion of carbohydrates, fats and proteins into carbon dioxide and water. However, the mitochondrion has many other functions in addition to the production of ATP. Of course, the role they play as cellular furnaces, converting nutrients and oxygen into energy, is immensely important. Every cell needs ATP—the chemical fuel generated by mitochondrion—and some cells are particularly demanding: a muscle cell that pushes the leg into a sprint, a beta cell in the pancreas that synthesizes the hormone insulin, a brain cell that fires a signal to help create a thought. Each of these kinds of cells contains as many as 10,000 mitochondria, and it's no secret that those tiny organelles keep the home fires burning. However, recent studies suggest that "petite organelles" do much more than generate energy. They are intimately involved in cell signaling, raising a red flag during times of cellular stress, such as when viruses invade or oxygen levels drop. It now appears that subtle abnormalities in mitochondrion contribute not only to rare metabolic disorders but also to many common diseases, including chronic hepatitis, cancer, and certain aging-related diseases, such as type 2 diabetes. In most tissues, the "powerhouses" consume 90 percent of the oxygen that enters the body. So it makes sense that the petit organelles would function as oxygen sensors as well. M. Celeste Simon, an HHMI investigator at the University Of Pennsylvania School Of Medicine, decided to explore this idea in 1997. "Understanding how oxygen levels are sensed and adapted to is fundamentally important to dealing with pretty much all of the major diseases that we encounter—atherosclerosis, autoimmune disease, stroke, and cancer," she says. For instance, solid tumors begin to grow outside the body's circulatory system, where oxygen levels are low, and they do so by turning on signals that tell tissues to sprout new blood vessels. Understanding how to disrupt this signaling might lead to new cancer treatments. Normal adult tissues, such as kidneys, can also experience low oxygen because of poor circulation and other dysfunctions. In that case, if doctors could enhance the signaling process, they might be able to promote blood vessel development and restore an organ's function. Researchers now know that mitochondrial dysfunction could affect more than just the cell's ability to produce energy, says Simon. "Many metabolites produced in the mitochondria have an impact on the rest of the cell, and these will be really important to consider in disease." As Shadel puts it, "The role of mitochondria in the cell is grossly underestimated, as is their role in human disease."